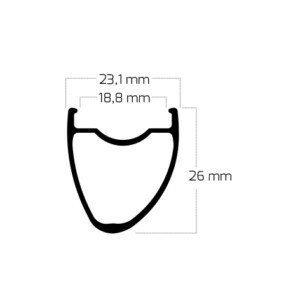 You can use any of the road rims that we sell on a road disc bike but we have separated the rims specifically designed for road disc use here to be discussed in their own right. Below, they are compared for their respective strengths. If you are concerned about weight but want to use disc brakes you might find this article on Lightweight Road Disc Wheels helpful. Nearly all of these rims can be used for gravel and CX applications. Below is a basic comparison of the rims that we commonly offer. The most popular models are the, DT Swiss R460db for economy, DCR 24/25 for excellent all round balance and the DCR Premium 35mm disc for an excellent value carbon rim offering pretty much all that anyone could ask for in a carbon road disc rim. Each of these rims offer key, competitive options at popular price points. Prices for sets with DCR hubs start at £280/pair. Shall I just pick the lightest? Well, nearly always the answer is no. We like to think of weight saving as the last thing you should get round to sorting out, but ultimately what you are aiming for. So there has to be a strength requirement met. There has to be a stiffness requirement met. You have to be able to live with the components, so there needs to be a degree of practicality. It may seem fun to just spec a really light set of wheels, but it may be just an awful choice. 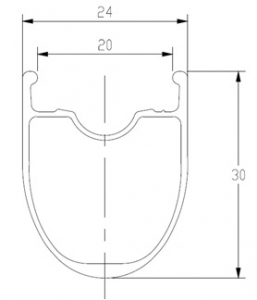 It may lack features that you are looking for as well, such as tubeless compatibility, a wide profile, potentially an offset profile. It may just crack, rattle or break. You may find that initially you want something that is just light, but you find yourself regretting that as soon as you run into problems. Some things are light and stiff but simply not durable. Something to bear in mind is, there is no magic. It is about spreading your material of choice into the best possible shape; that has limits. If a rim is lighter, there is just less material, that is the only way that can be delivered. Poor design can be weak, flexy and heavy. So a heavy rim may well have significant downside aside from its weigh. We just want you to remember that there is a limit to design itself. Much more so with aluminium than with composites as the material properties are much more fixed. Shall I just pick the deepest as that will be the most aero? For my money, aerodynamics is reserved for composite rims. There are a few exceptions. However below 30mm, and really basically all alloy rims are below 30mm, there is very little aero benefit. Beyond 30mm, it starts to make much more sense, so while making your bike aero is probably for most riders the best way to make it faster, to do that, you pretty much have to use carbon rims. If it is alloy, a deep rim will probably be heavy and harsh, especially if it is also narrow. However deeper rims are generally stiffer, so a bigger rider may well want a deeper rim for extra strength and stiffness. They are also more visually imposing. A few more details on a some of the models above can be found below. We update the site with information as often as possible, but if you want any details on any of these components, please feel free to contact us. If you want any information on any of these carbon rims, please get in touch. For details on DCR carbon rims. Please visit the DCR carbon rims section on this site. The lightweight of the road disc range. 85kg rider weight limit on this. A much more limited rim than the very versatile 24/25. However making lightweight disc rims available at affordable prices. We nearly always recommend the much more practical 24/25 rim. All DCR alloy rims are a matt black finish, shot blasted first, then anodised. They have no decals on at all. A welded joint means easy sealing with tubeless. The deep cavity in the centre of the rim means easy fitting of tyres. The 425g weight means if you paired this rim up in a 24/24 drilling (my preference would normally be 28/28) with Tune Prince/Princess hubs (to illustrate what is possible) you would have a set weight of around 1380g. This rims is just the bigger brother to the 24/25. As a result is is naturally stiffer. It is hard to say whether it is stronger, the spoke bed and sidewall are the same. The profile being stronger means it will be more resilient and it is a naturally stiffer and more aerodynamic profile. There is physically more material there in the profile too. I would say that both are strong, both have a rider weight of 120kg however for riders over say 100kg, you will probably feel more comfortable on this rim rather than the 25. The rim is also better suited to touring use than the 24/25. With this rim DT have carried on their trend of providing surprisingly good value rims. It is what you would ask for if you wanted a good value, decent performing rim. It is a solid option for more economical builds. 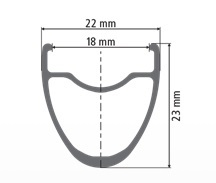 DCR standard hubs, Race spokes and this rim would cost £280. The Notubes Grail improves upon the Alpha in a number of ways – it is stiffer, stronger, more aerodynamic and better suited to a broader range of applications and tyre widths. It is deeper and wider than the Alpha. It is 35g heavier, so if you wanted the lightest BST, then the Alpha is the choice to go for. However the use of material has been more carefully optimised on the Grail which has different spoke bed thicknesses at different points in the rim. So the extra weight has been spent very wisely. The Grail builds into nice wheels and with disc brake road rims being used commonly for a broader mix of applications than simply on road use, the Grail provides a nice package for gravel, adventure and path riding. The BST also probably remains the easiest system to setup tubeless and means material is spared for where you want it in the rim. Keeping the strength to weight high on these rims. Use it for training, use it for racing. Use it for your road bike, use it for your gravel racer. Or even use it for cyclocross. The DP Comp Disc handles it all with the same easy and helps you to get the best out of yourself. The offset profile will make your wheel stronger, stiffer and longer lasting and will help spread the higher braking forces from a disc brake more evenly over the wheel. I like the DP Comp disc. It is a bit more economical than the DCR rims and most of the other rims featured here, yet it is nice and tough. Ryde have just been less ambitious with the profile but they have made the rim well. I would say it is a worthwhile upgrade over the DT R460DB, however the DCR 24/25 is only a modest upgrade in cost from here and features a welded joint and a stronger alloy. The DP Comp is also better suited to narrower tyres than the lighter cousin the Pulse Comp Disc, so while the Pulse looks like an upgrade, it is more different than you may think. Ryde tried to make a very light disc brake rim before with the Ryde Pulse Disc, however the problem was that the extrusion was a little on the optimistic side, it was too narrow and there was just too little material there. The rim, while being very light, was flexy. With the Pulse Comp, the extrusion is very up to date. It fits in with the demand for ever wider rims. It is also a smoother, snub nosed aero profile. I am assuming that 8 bar pressure is on the basis of a 23c tyre, if you are running wider, I would definitely keep pressures below that. The extrusion is still pushing the limits of what is possible. However the large width, depth and offset drilling allows this rim to be a much more balanced package. We would only recommend using this rim if you are a lighter rider. However, if you are a lighter rider, it can offer a great option as it allows for much lighter wheels without having to pay a premium for some very expensive hubs or a carbon rim. 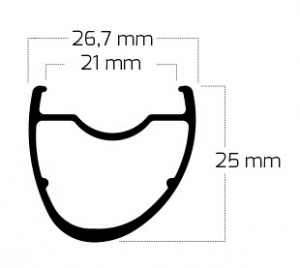 For example CX-Rays and DCR centre lock hubs with this rim would come in at around 1460g and would cost £490. The Aileron is the most expensive rim here. Also, while the published weight is 460g, Velocity are displaying their usual optimism with that. Expect this rim to weigh around about 20g more than the published weight, perhaps more as one I had the other day wasn’t far short of 500g. However, this is a rim that is great for people who aren’t too hung up on weight…or price. It is very, very stiff, which is hardly surprising as it is one of the deepest rims here and also as wide as the widest. It also has what appears to be the most aerodynamic shape (not something I have data for) and being a Velocity rim you can rely on it to be nice and strong. So if you are a powerful rider and want something nice and stiff and strong – great choice. You can run it tubeless, you can run it offroad. Information on disc brake hubs can be found here.